Weight loss, better health, sustainable change, and the relentlessness attitude is what you'll get with these 8 steps to break free. The 365 WOD Journey (WOD = Workout Of the Day) will provide the consistency, determination, and community that you've always wanted. You can do the WODs at your home, work or anywhere else. No equipment required. This 365 WOD journey starts with you. Commit yourself to do one round of a WOD for the number of days a week you're comfortable with. The 8 steps to break free are right below the video. Before you get to the 8 steps, consider watching the video. See how simple it is to turn a sunroom into a gym within seconds. 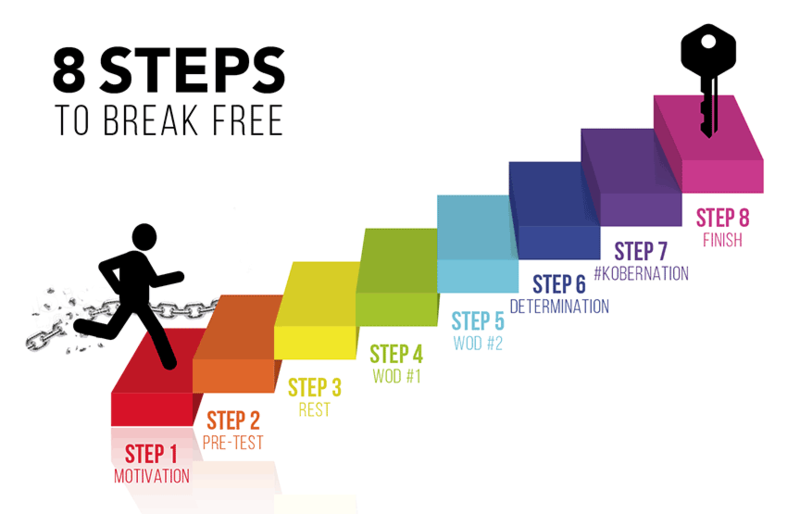 Going through the 8 steps to break free you'll finally be free from your old life. You'll create a new life and be excited about it as soon as you open your eyes each day. Step 7: #KoberNation – Become a part of the #Kobernation by sharing the WOD link to your social media platform of choice and using #Kobernation each time you complete a WOD (You're a part of the #Kobernation as soon as you complete your first WOD) The #KoberNation is our community of people who are going through the same struggles you are. As a community we all support one another each and every day. If you're willing to change from the neck up, then you WILL change from the neck down. I believe in you, not it's your turn to start believing in yourself.